What is frontotemporal dementia (FTD)? This information comes from Alzheimer’s Society, a wonderful organization based out of the UK. They are one of my go-to sources for information and I highly recommend taking a look around their website. They offer the information on their website to be freely used by others, so I am posting the information in full. You can access the same article on their website as well as resources on dementia by clicking on the title, below. Frontotemporal dementia (FTD) is one of the less common forms of dementia. The term covers a range of specific conditions. It is sometimes called Pick’s disease or frontal lobe dementia. This factsheet explains what frontotemporal dementia is, who gets it, and the symptoms. It also describes how it is diagnosed and the treatment and care that is available. The word frontotemporal refers to the two lobes of the brain that are damaged in this form of dementia. The frontal lobes of the brain – situated behind the forehead – control behaviour and emotions, particularly on the right side of the brain. They also control language, usually on the left. The temporal lobes – on either side of the brain – have many roles. On the left side, these lobes control the understanding of words. 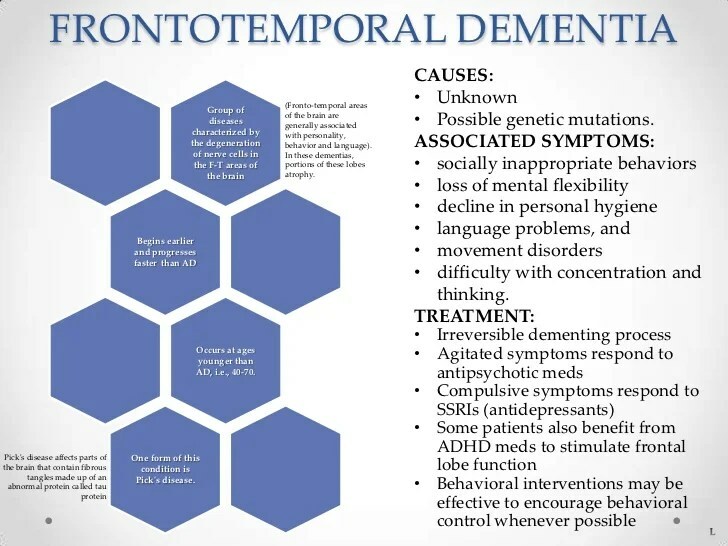 Frontotemporal dementia is caused when nerve cells in the frontal and/or temporal lobes of the brain die and the pathways that connect them change. There is also some loss of important chemical messengers. Over time, the brain tissue in the frontal and temporal lobes shrinks. This damage to the brain causes the typical symptoms of frontotemporal dementia, which include changes in personality and behaviour, and difficulties with language. As frontotemporal dementia is a less common form of dementia, many people (including some health professionals) may not have heard of it. Frontotemporal dementia occurs much less often than other forms of dementia (such as Alzheimer’s disease or vascular dementia). However, it is a significant cause of dementia in younger people (under the age of 65). Frontotemporal dementia is probably the third most common cause for people in this age group. It affects men and women about equally. Frontotemporal dementia is most often diagnosed between the ages of 45 and 65, but it can also affect younger or older people. This is considerably younger than the age at which people are most often diagnosed with the more common types of dementia such as Alzheimer’s disease. For more information, see factsheet 440, Younger people with dementia. As with most forms of dementia, the initial symptoms can be very subtle, but they slowly get worse as the disease progresses over several years. This form is diagnosed in about two thirds of people with frontotemporal dementia. During the early stages, changes are seen in the person’s personality and behaviour. crave sweet or fatty foods, lose table etiquette, or binge on ‘junk’ foods, alcohol or cigarettes. It is common for a person with behavioural variant frontotemporal dementia to struggle with planning and organising or making decisions. These difficulties may first appear at work or with managing finances. In contrast to Alzheimer’s disease, people with early-stage behavioural variant frontotemporal dementia tend not to have problems with day-to-day memory or with visuospatial skills (judging relationships and distances between objects). It is unusual for a person with behavioural variant frontotemporal dementia to be aware of the extent of their problems. Even early on, people generally lack control over their behaviour or insight into what is happening to them. The symptoms are more often noticed by the people close to them. In the other two types of frontotemporal dementia, the early symptoms are progressive difficulties with language. These difficulties become apparent slowly, often over two or more years. impaired understanding of complex sentences, but not single words. difficulty recognising familiar people or common objects. In both of the language forms of frontotemporal dementia, other aspects of mental function (memory, visuospatial skills, planning and organising) tend to be well preserved in the early stages. The rate of progression of frontotemporal dementia varies greatly, from less than two years to 10 years or more. Research shows that on average, people live for about eight years after the start of symptoms. As frontotemporal dementia progresses, differences between the three types become much less obvious. People with the behavioural variant tend to develop language problems and may eventually lose all speech, like a person with one of the language variants. Similarly, over several years a person with semantic dementia or progressive non-fluent aphasia will generally develop the behavioural problems typical of behavioural variant frontotemporal dementia. In the later stages of all forms of frontotemporal dementia, damage to the brain becomes more widespread. Symptoms are often then similar to those of the later stages of Alzheimer’s disease. The person may become increasingly less interested in people and things and have limited communication. They may show restlessness or agitation, or behave aggressively. At this late stage someone may no longer recognise friends and family, and is likely to need full-time care to meet their needs. Their symptoms are similar but can include twitching, stiffness, slow movements and loss of balance or coordination. In the later stages there are often difficulties with swallowing. The three motor disorders share some symptoms with Parkinson’s disease. For more see factsheet 442, Rarer causes of dementia. These motor disorders are all degenerative diseases of the nervous system, meaning that they will get worse over time. The condition of a person with frontotemporal dementia and motor neurone disease can deteriorate quite quickly. On average, a person with both conditions will live for two or three years after diagnosis. The cause of frontotemporal dementia is not known. Experts assume that the disease reflects a mixture of genetic, medical and lifestyle factors. Unlike Alzheimer’s diseaseor vascular dementia, it doesn’t seem that frontotemporal dementia becomes much more common in older age. Autopsy studies show that the death of nerve cells in the frontal and temporal lobes is linked to clumps of abnormal proteins inside the cells, including one called tau. The tau protein may take the form of Pick bodies, which gave frontotemporal dementia its original name of Pick’s disease. Frontotemporal dementia runs in families much more often than in the more common forms of dementia. About one third of people with it have some family history of dementia. About 10-15 per cent of people with frontotemporal dementia have a strong family history of it, with several close relatives in different generations affected. In contrast, strongly inherited early-onset Alzheimer’s disease affects less than 1 in 1,000 people with Alzheimer’s. Typically in these cases, frontotemporal dementia is inherited from a parent as a defect (mutation) in one of three genes: MAPT, GRN or C9ORF72. The children or siblings of someone with one of the mutations known to cause frontotemporal dementia are at 50 per cent risk of carrying the same defective gene. Families with a known mutation should be offered a referral to a specialist genetics service for counselling. For more about genetic testing, see factsheet 405, Genetics of dementia. Frontotemporal dementia can be hard to diagnose, because it is uncommon and does not initially cause memory problems. Doctors may also not suspect dementia in a middle-aged person. Frontotemporal dementia may be misdiagnosed as atypical Alzheimer’s disease (a form of Alzheimer’s disease without early memory loss). Behavioural symptoms may be mistaken for depression, schizophrenia or obsessive-compulsive disorder. Problems with language or movement may be misdiagnosed as stroke. Blood tests and a thorough physical examination are important to rule out other possible causes of symptoms. A specialist may suspect a diagnosis of frontotemporal dementia after questioning the affected person and someone who knows them well. The specialist will take a detailed history of their symptoms and gather information to gain a wider picture of the person’s behaviour and functioning in their daily life. Standard cognitive tests, which tend to focus on memory loss, can be less helpful in the diagnosis of frontotemporal dementia. More specialised tests of social awareness or behaviour may be needed. CT (computerised tomography) and MRI (magnetic resonance imaging) brain scans should be used to assess the pattern of damage to the brain. They can also rule out other possible causes of symptoms such as stroke or tumour. If further tests are needed, more specialised brain scans will be carried out such as PET (positron emission tomography) and SPECT (single photon emission computerised tomography) to measure brain activity. These scans are useful as they may detect reduced activity in the frontal and/or temporal lobes at an earlier stage than a CT or MRI scan might show structural changes. Further tests may include a lumbar puncture, which involves collecting and analysing fluid from the spine and is carried out mainly in younger people. Where a strongly inherited form of frontotemporal dementia is suspected, genetic testing may confirm the diagnosis and potentially allow family members to find out whether they will go on to develop frontotemporal dementia in their lifetime. The decision to find out is up to the individual and support is available. After a person dies, it is possible to make a pathological diagnosis of frontotemporal dementia as the changes to the brain can be directly seen at a post-mortem. Researchers are working to find effective new treatments for frontotemporal dementia, but there is currently no cure and the progression of the disease cannot be slowed. Approaches to treatment look to ease symptoms or help people cope with them. Supporting a person with frontotemporal dementia usually requires input from a team of professionals. These can include a GP, community nurse, psychiatrist and speech and language therapist. When someone has problems with movement or coordination, support from a physiotherapist or occupational therapist is often needed. Caring for someone with frontotemporal dementia can be particularly challenging, because of the young age of onset, and changes in behaviour and communication. Where a gene mutation which causes frontotemporal dementia is identified, birth relatives will face additional issues of whether to have genetic counselling and testing themselves. Specialist support groups for younger people with dementia or those with frontotemporal dementia and their carers can provide invaluable practical and emotional support (see ‘Other useful organisations’). Social interaction can also help if the affected person seems to lose motivation in things or appears bored or lonely. Many people with frontotemporal dementia continue to lead an active social life for some years following diagnosis, but changes in behaviour can begin to make social situations more challenging. It can be less stressful for carers to try to accept potentially embarrassing behavioural symptoms as part of the disease, rather than to confront or correct the person, unless the behaviour poses a risk of harm. The person with dementia will generally lack insight into their condition or the impact of their behaviour on others. They will generally not have much control over their actions. So long as the behaviour is harmless, it may be easier for a carer to allow someone to carry on with it. The person may prefer to follow a fixed routine or pursue an obsession (eg with jigsaws). Many carers offer support to help minimise the opportunity for compulsive eating – for example, by offering food only at mealtimes and in suitable portions. The person’s use of alcohol may also need to be closely monitored. It is important to try to manage restlessness, agitation or aggressive behaviour without drugs initially, where possible. This behaviour might result from a person trying to communicate an unmet need, such as the person feeling frustrated or in pain. Physical exercise and enjoyable, tailored activities carried out within a structured routine can help. There is evidence that certain antidepressant drugs improve apathy (little interest in people and things) and behavioural symptoms. If antipsychotic drugs are being considered for a person with frontotemporal dementia, advice from a specialist on the risks and benefits is recommended. There have been a few small trials in people with frontotemporal dementia of the Alzheimer’s disease drugs (donepezil, rivastigmine, galantamine and memantine) with mixed results. In some cases these drugs made symptoms worse. They are also not licensed for use in frontotemporal dementia and not widely prescribed. A speech and language therapist with relevant experience can support someone with frontotemporal dementia who is gradually losing their language skills. The emphasis is on maximising existing skills and finding new ways of communication rather than on improving speech. A therapist can advise the carer on new ways of listening and talking – for example in simpler sentences. In time, a person who is losing their language skills may be taught non-verbal ways of communicating. These can include the use of gestures, drawing or electronic devices. A speech and language therapist can also assess swallowing and offer practical advice on eating and drinking. © Copyright 1998-2015 Alzheimer’s Society. All rights reserved. You can also learn more about FTD through The Association for Frontotemporal Degeneration. Can they live alone by themself and how can we control them to take pills ?! Can we talk to them about the problems she has?! She won’t listen and get angry when I call her everyday she said why yr calling me everyday ,….. She behave bad she loves me someday but she don’t want to see me Iam a stranger to her but she is good in reminding me of days that , she talks to some body passed away in midnight it’s scares me very much but she talk very sharp she don’t want to live with me and her grand daughter she is ok by her self and won’t accept strangers and this and happens has many illusions that she is talking about ,.!????? Hi Rose, thank you for posting your comments and questions. Let me start by saying that it is best to talk to her neurologist or health care professional about the situation. They will be more familiar with her health and her symptoms and can better assess what would work best for her situation. This is my top recommendation I can give, and please be sure to bring up the illusions you mentioned. People who have FTD can live by themselves in the earlier and milder stages of dementia, but at some point it will become unsafe and it is good to start coming up with a plan now, before something happens and that day arrives before you have thought about it. Regarding calling her every day, perhaps it is best to keep these phone calls as social calls, rather than as obvious check-ins. She may be sensing that you are calling to check in on her and is likely not aware of the full extent of her FTD, so to her, it seems simply like you don’t think she is capable of living alone. While you may think this, it won’t be helpful to either of you if the phone calls center around this. Instead, reaffirm that you are calling because you care about her, were thinking of her and wanted to talk to her. I hope you do take this conversation up with a health professional who knows her/you and the situation. Please feel free to update us and to ask any other questions you might have.